Christine and Ron were one of the most outgoing couples we have ever photographed. They had such upbeat and fun personalities and it showed in their images. Christine got ready at the Foundry Suites in Buffalo and Ron was right across the street getting ready. We love working at the Foundry. The rooms are gorgeous for brides and grooms to get ready in. They are huge and have giant windows. We love the brick walls and pipes that are in the rooms too! After we photograph all of the bride's details (shoes, dress, jewelry, flowers, invitation, or anything she is incorporating for the day), we have her get into her dress. Then we do some portraits. After finishing those up, we like to bring in dad for a first look if he is present. 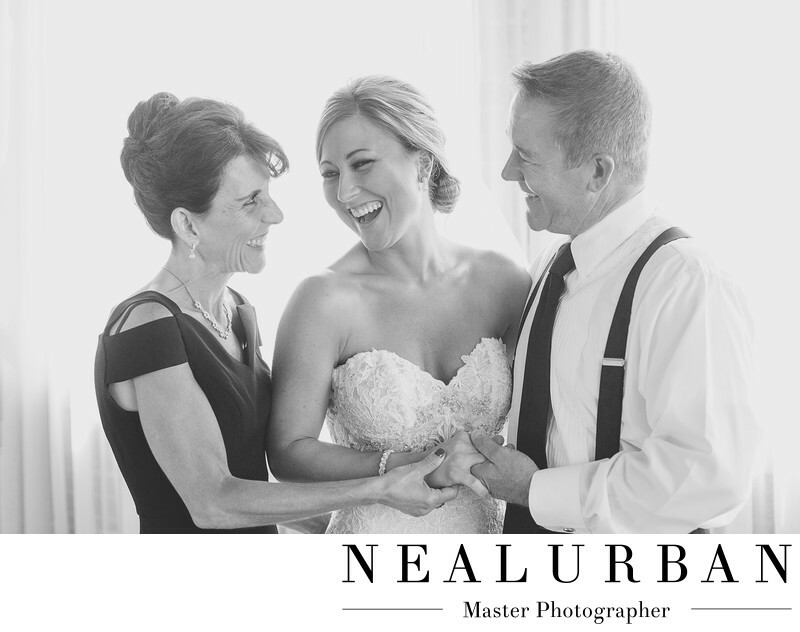 We also like to do some formal portraits with the bride's parents too. This is what you see here. They all had the same outgoing personalities! They could not stop laughing. This was so casual too. Parents of the bride were chatting with the bride and making jokes. We could hear the bridesmaids all laughing behind us, which made everyone laugh. We love these moments! They are unplanned and describe this families relationship great! We could not wait to have bride and groom and both of their families together after the ceremony. The ceremony was at St. Adalberts Basilica in Buffalo. It was a Polish style Cathedral. We had seen this church from the 190 South many times driving and always wanted to photograph a wedding there. When Ron told us that was it, we were so excited. It was a family church and they were going to be the last bride and groom married there before it was to close down. The inside was amazing! We stayed as long as we could and did wedding portraits there! The reception at the Foundry was just as fun and exciting as this picture. Their playlist for the party was so much fun! They sat us with some of their close friends for dinner and they made us feel like part of their group! When we get welcomed how we did at this wedding, we always get such great images. The guests are excited and happy to have their photos taken and are not as shy when we can start up a quick conversation with them! Location: 1738 Elmwood Ave Buffalo, NY 14207.